Reform is coming – but probably not quite as quickly as we’d like. That was the message from the National Medical Examiner when he addressed the National Association of Funeral Directors on the issue of death certification reform. 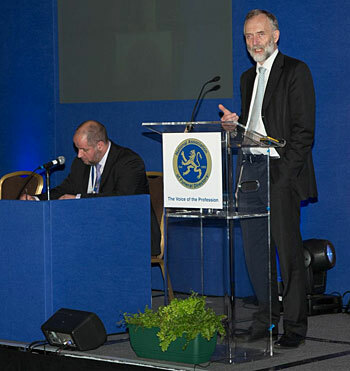 Professor Peter Furness told the association's conference in Manchester that the current system was subject to abuse, as the Dr Harold Shipman murders graphically demonstrated, and problems had been flagged up as far back as a Select Committee Report of 1893. He said the new regulations of the 2009 Coroners and Justice Act would remove many of the existing problems; the bereaved would find them helpful and they would ensure that the cause of death was much more likely to be accurate, but he expected the final implementation of the Act to take at least another 12 months. The aim of the reform is to reduce the thousands of certification mistakes by doctors each year and to alert authorities to criminal activities, as well as substandard treatment and care. Under the new regulations, for the first time, proposed natural causes of death will have to satisfy the medical examiner. The medical examiner will have to speak to the next of kin and scrutinise the medical records, as well as speaking to medical and nursing staff, before providing formal confirmation of cause of death. Five pilot schemes have shown a large reduction in referrals to the Coroner and have picked up cases that should be referred to Coroner. Extrapolating pilot data suggests that about 6,000 deaths per year in England and Wales that are currently registered as ‘natural causes’ actually ought to be investigated by inquest. The new system takes up to half a day longer on average than a burial case, but ‘crem forms’ will be abolished and the number of certificates rejected by the Registrar (which can cause great distress to bereaved families) is pretty much zero. Funding is a potential delay, as the original plan to replace cremation forms with a fee levied on all deaths in England and Wales not referred to a coroner (dubbed the ‘tombstone tax') has not gone down well with various groups, including the funeral profession. Ministers could collect a fee or cover the cost from central taxation and a public consultation is planned.